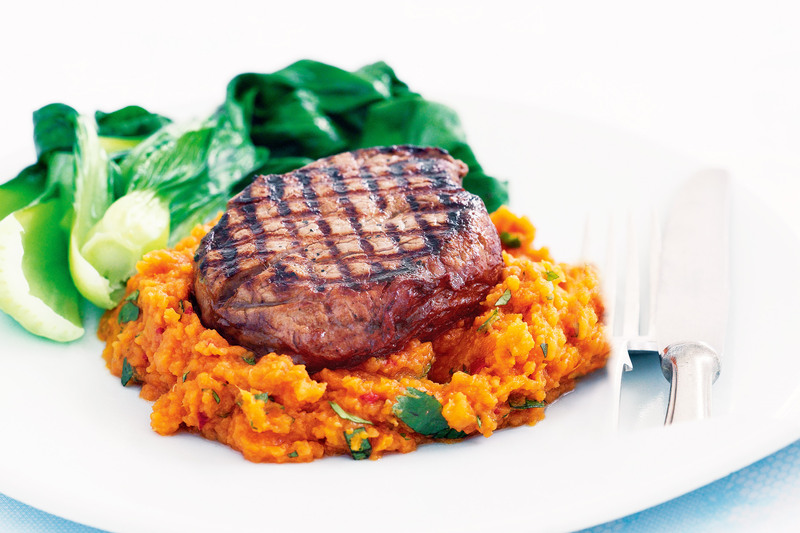 Protein-packed beef steaks are teamed with spicy sweet potato for a super-healthy meal. Combine the soy sauce, mirin and honey in a shallow glass or ceramic dish. Add the beef and stir to coat. Cover with plastic wrap and place in the fridge for 30 minutes to marinate. Cook the sweet potato in a large saucepan of boiling water for 12 minutes or until tender. Drain and return to the pan. Use a potato masher to mash until almost smooth. Meanwhile, preheat a chargrill on high. Spray with olive oil spray to lightly grease. Drain the beef from the marinade. Cook the beef on grill for 2-3 minutes each side for medium or until cooked to your liking. Transfer to a plate and cover loosely with foil. Set aside for 2 minutes to rest. Heat the oil in a small frying pan over medium heat. Add the ginger and chilli. Cook, stirring, for 1 minute or until aromatic. Add the ginger mixture and coriander to the sweet potato and stir to combine. Taste and season with pepper. Divide the sweet potato mixture and Asian greens among serving plates. Top with the beef and serve immediately. What kind of advice are you searching for? I might be able to hit the topic you’re interested in. If you tell me more specifically what type of stuff you’re looking for, I might be able to suggest something. I’ll do my best, anyway.